>Can I use a dermaroller to enhance Latisse absorption? LATISSE is prescription treatment for eyelash length, thickness and color enhancement. No, you cannot use a dermaroller. Latisse must be applied to the roots of the upper eyelashes and a dermaroller cannot be used on the eyelids due to potential eye injury. You can use Latisse to grow eyebrows as well even though it is not officially promoted for eyebrows. The active ingredient of Latisse is Bimatoprost 0.3 mg/mL. Bimatoprost has been used to treat glaucoma (longer/thicker eyelashes were the unexpected "side effect"). "After 16 weeks, 78% of those in the bimatoprost group had at least a 1-point increase on a scale that measured eyelash prominence compared with 18% of those on the vehicle." It can take up to 4 months to achieve the full results. A bottle normally lasts 6-8 weeks. Do not apply it to the eyelashes but to the skin - the base of the eyelashes. Try to prevent it getting into your eyes. If it gets into your eyes, you do not have to rinse it. It is not dangerous because it is an ophthalmic solution but you should avoid getting it repeatedly into your eyes since it reduces intraocular pressure. If you discontinue the product for a significant time, the lashes will gradually (in 1-2 months) go back to their original state. Lumigan drops for glaucoma are identical to Latisse but much cheaper. Revitalash and some other products do no longer contain Bimatoprost due to patent issues. If our customers say this (and we do get emails about this) then it may be true, because Lanolin has been found in scientific studies to be such an extremely effective skin moisturizer that they wanted to go to the bottom of it and find out how it could be that this simple, cheap natural product basically outperforms any other product. My take on it is that Big Pharma, not being able to patent Lanolin, has tarnished its reputation, claiming "allergies" where none existed. I dug into the scientific research of Lanolin, and Wikipedia has some very interesting info on it, including the "Lanonin allergy" myth and its falsified science. Instead of testing a random group of people for Lanolin allergy, they tested people with existing dermatological problems. And still only 1% had a Lanolin allergy! We found research that a pure Lanolin allergy in fact does not exist at all, and we already posted the link to the relevant scientific research. In short, Lanolin is a veritable dermatological miracle. Nature's perfect moisturizer. It's so puzzlingly effective that several research projects tried to discover exactly how it works. Sadly, I was accused on a skin care forum that Infadolan ointment is "cheap and contains nothing special". Yes - it's good value for money but no, it does contain something very special! We sell Infadolan as dermarolling/needling aftercare and lanolin with its excellent moisturizing properties and non-acidic form of vit. A was one of the reasons why I chose it. I don't understand why people think that a cream is good just because it costs 100 dollars, why they prefer creams with dozens of chemicals or why they believe that snake venom cream or other exotic sounding ingredients will help their wrinkles. Hydrating creams do not hydrate skin, long-term. In fact, hydrating creams saturate the skin surface with water, making the skin look temporarily better but this very temporary hydration actually increases the evaporation of water from the skin! After several hours you end up with drier skin than you started with. You again apply hydrating cream and the vicious circle continues. You have to prevent water vaporization from the skin to achieve good moisturisation. The cream has to be semi-occlusive. Semi-occlusive ointments such as Infadolan are not suitable for daily care of acne prone skin or oily facial skin but they are excellent for super-moisturisation (thus diminishing lines and wrinkles) and protection of dry areas on the face and body – such as around the eyes, the lips, the back of the hands etc. Apply just a little - there is not need for heavy application. Infadolan is a medical grade, regenerative ointment with vitamins A, D and Lanolin. No preservatives, no fragrance. It is indicated for first-degree burns and other smaller injuries. It helps the protection, re-epithelization and regeneration of the skin. The vitamins A & D are very beneficial for the skin and Lanolin is an outstanding moisturizer. "New products obtained using complex purification techniques produce lanolin esters in their natural state removing oxidative and environmental impurities resulting in white, odourless, hypoallergenic lanolin. These ultra-high purity grades of lanolin are ideally suited to the treatment of dermatological disorders such as eczema and on open wounds. Some years ago, lanolin attracted a great deal of attention owing to a misunderstanding concerning its sensitising potential. A study carried out at New York University Hospital in the early 1950s had shown that approximately 1% of patients with dermatological disorders were allergic to the lanolin being used at that time. However, this figure was misinterpreted and taken out of context and became quoted as 1% of the general healthy (American) population. It has been estimated that this simple misunderstanding by failing to differentiate between the general healthy population and patients with dermatological disorders exaggerates the sensitising potential of lanolin by approximately 5,000 - 6,000 times. More recently, using modern scientific methods, attention has focused on the positive aspects of lanolin and on increasing our understanding about how lanolin achieves its beneficial skin effects. Modern analytical methods have revealed that lanolin possesses a number of important chemical and physical similarities to human stratum corneum lipids; the lipids which help regulate the rate of trans-epidermal water loss and govern the hydration state of the skin. Cryo-scanning electron microscopy has shown that lanolin, like human stratum corneum lipids, consists of a mass of liquid crystalline material. Cross-polarised light microscopy has shown the multi-lamellar vesicles formed by lanolin are identical to those formed by human stratum corneum lipids. It is well known that the incorporation of bound water into the stratum corneum involves the formation of multi-lamellar vesicles. Skin bio-engineering studies have shown that the durational effect of the emollient (skin smoothing) action produced by lanolin is very significant and lasts for many hours. Lanolin applied to the skin at 2mg cm-2 has been shown to reduce roughness by ca. 35% after 1 hour and ca. 50% after 2 hours with the overall lasting for considerably more than 8 hours. Lanolin is also known to form semi-occlusive (i.e. breathable) films on the skin. When applied daily at ca. 4 mg cm-2 for five consecutive days, the positive moisturising effects of lanolin were detectable until ca. 72 hours after final application. It has been postulated that lanolin may achieve some of its moisturising effects forming a secondary moisture reservoir within the skin." Infadolan is so popular that we often replenish our stocks. The expiry date is stamped into the base of the tube. Current batches expire around 2014. Yes it is normal. Some people peel more, some less. A dermaroller makes lots of micro-holes that heal very quickly. The skin in the micro-holes is being renewed and the debris is expelled. Unlike a deep acid peel, a dermaroller doesn't remove entire layers of skin (removing entire layers makes the skin prone to infection, uneven pigmentation or scarring and it takes a long time to heal). With a dermaroller, you achieve deep renewal but the micro-holes are surrounded by untouched skin, which makes it much safer and quicker to heal. Therefore you can go much deeper with a dermaroller than with acid peels. "Just an update - turns out I have a form of discoid lupus, most likely triggered by immune changes induced by the vitamin a...."
"I took the high-dose as recommended by Linda Page (holistic practitioner) to get rid of stubborn warts". The word "Kerasal" is blue (it is a link). To Amazon.com, that sells it.. Took me a while to find it, actually. 0.05% Tretinoin is strong stuff, especially in gel form since the penetration of Tretinoin from a gel is easier. Tretinoin is very useful for acne, pigmentations, aging skin, sun damaged skin, scars and stretch marks but it is not a skin-friendly substance if you overdose it - it causes skin irritation, redness, excessive peeling, excessive sun sensitivity and itchiness. In medical studies there was no significant difference in the effectiveness of 0.025% and 0.05%. They were both the same effective. With Tretinoin, the more is not the better - both regarding the percentage of Tretinoin and the amount applied. Tretinoin dries up the skin so you have to balance it with a moisturizer. The outermost layer of skin consist of dead cells that are constantly shed and replaced by new cells coming up from the deeper layer of skin. Keratosis Pilaris is a condition in which the dead cells do not shed as they should. The pores with hair follicles are basically clogged with skin flakes and this makes the skin bumpy. You have to remove the debris. That needs quite some “aggression” directed towards your skin. Experiment with the applied pressure and frequency of using it. It should not leave bad scratches but you should apply enough pressure to remove those excessive flakes that are stuck. Pumice is more efficient when used dry on dry skin. Your skin has to get used to it, do not give up if the initial reaction of your skin is irritation. Keep the pumice clean by soaking it in hot water with some dishwashing detergent and rinse it well. You can put it in the dishwasher as well but since it's very light you should put a cup over it to keep it in place. Dermarolling speeds up the skin’s turnover but in the case of KP you need to target mainly the clogging of the hair follicle pores (full of skin flakes) and forcefully remove them. I think that pumice is a better choice in this case. 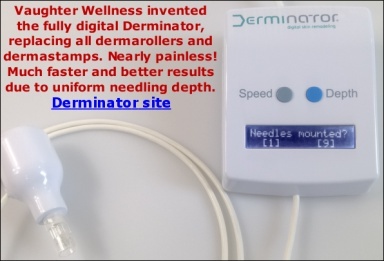 If you decide to use a dermaroller, buy one with a needle length of 0.2 mm and use it every other day or in this case even daily. If it stings, do not apply apple cider right after pumice or dermarolling. Apply coconut oil only or almond oil or a lotion with urea (for example Eucerin with 10% urea). If your skin is inflamed (red and itchy), dissolve Aspirin (not Paracetamol but Aspirin) in a little bit of water, spread it over your skin and when it absorbs, apply your usual oils or lotions. Let me know how it goes. If pumice doesn’t help I can think of another approach. Wait 3 weeks with 2 mm and one week with 0.25 or just roll around it. If it doesn't heal quickly and nicely, wait longer. Dry and flaky skin is normal several days after dermarolling because the skin is being renewed. It is basically a deep peeling. They are both superficial peels and the inflammation will subside very quickly. The skin is a very sturdy organ. It has to be, since it serves as our protection. Its toughness is mainly due to a protein called Keratin that makes up the outer layer of the skin. It should not be scaldingly hot, just hot and it will soften the skin and make it easier for the needles to penetrate. Another way is to use a product containing Keratolytics. Keratolytics soften keratin. Keratolytic agents are for example salicylic acid, urea, lactic acid, and allantoin. They are in creams for cracked heels, callus removal or Psoriasis and contain about 5% Salicylic acid and 10 % Urea. You can buy Kerasal(tm) or something similar. Put it on your skin about one hour before needling. It will soften the skin but do not expect that the needles will then go into the skin easily. The skin will be still tough, just a little less. Our skin is designed not to soften easily. Because this would compromise its protective ability and we would be prone to injury and at the mercy of infectious agents. The reason why mature stretch marks and other mature scars are whiter than the surrounding skin is because scar tissue has a limited blood supply and it has an insufficient amount of functional melanocytes. Melanocytes produce melanin. Melanin is the pigment that determines the color of our skin. When our skin is exposed to the sun, the skin produces more melanin as a protection – melanin absorbs UV. Dermarolling and especially more intensive procedures such as single needling or dermastamping can trigger neovascularization (formation of new blood vessels) and new melanocytes production. Moreover, it crushes the hardened scar collagen and that softens the stretch mark. This should improve the color and texture of your stretch marks (if you are lucky, patient and persistent). Pre-treat the skin with dry brushing, Tretinoin gel and vit. C according to our instructions. Roll the whole area with 1.5 mm roller. Immediately, or some days later after rolling with a 1.5mm roller, single-needle or derma-stamp the stretch marks only. If you want to further increase the chance of color improvement, you can attempt to transfer melanocytes from normal skin to your stretch marks. Melanocytes aren’t very deep in the skin. They are at the bottom of the epidermis, which is about the depth to which the 0.5 mm roller penetrates. Immediately after single needling or derma stamping, use a 0.5 mm roller to attempt melanocytes “transplantation”. Use stretch mark free skin to harvest the melanocytes . First needle or stamp the stretch marks/scars. Then roll your stretch marks free skin with 0.5 mm to hopefully harvest some melanocytes with the needles of the roller – then immediately roll over your stretch marks/ scars to hopefully implant them. Repeat this harvest/implant procedure several times during one procedure.